Sunroof, Perforated Leather Seating, Power Release Second Row Bucket Seats, Cruise Control! As capable as it is handsome, this GMC Yukon is the perfect SUV for the modern family. 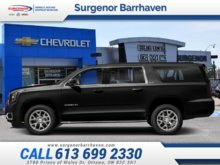 This GMC Yukon is a traditional full-size SUV that's thoroughly modern. With its truck-based body-on-frame platform, it's every bit as tough and capable as a truck. 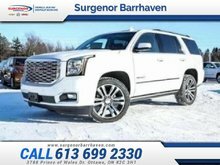 The handsome exterior and huge, well-appointed interior are what make this SUV a desirable family hauler. 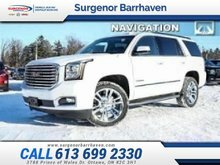 This GMC Yukon a cut above the competition in tech, features, and aesthetics while staying capable and comfortable enough to take the whole family and a camper on those long adventures. This GMC Yukon does it all in style. This onyx black SUV has an automatic transmission and is powered by a 5.3L V8 16V GDI OHV engine. Motivated by that brawny motor it gets 15.8 L/100 km in the city and 11.1 L/100 km out on the highway according to Transport Canada. Our Yukon's trim level is SLT. This SLT Yukon was built to impress with amazing features like low speed automatic forward braking, forward collision alert, lane keep assist with lane departure warning, blind spot monitoring, vibrating safety alert seat, IntelliBeam, hands free power liftgate, heated leather seats, cooled front seats, and auto dimming mirrors. Other features include powertrain assistive grade braking, trailering equipment with a receiver and wiring, aluminum wheels, active aero shutters, black assist steps, fog lamps, rain sensing automatic wipers, 110V power outlet, Driver Information Centre, 4G WiFi hotspot, parking assistance, GMC Connected Access, heated leather steering wheel, rear view camera, remote entry and starting, Teen Driver Technology, tri zone automatic climate control, an 8 inch touchscreen, Apple CarPlay, Android Auto, Bluetooth, SiriusXM and HD Radio, voice controls, and a premium Bose sound system. This vehicle has been upgraded with the following features: Sunroof, Perforated Leather Seating, Power Release Second Row Bucket Seats, Cruise Control. 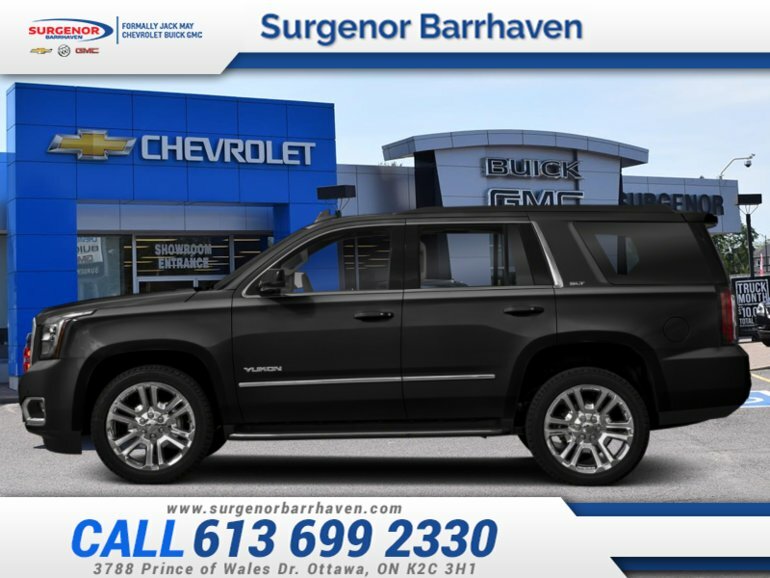 To view and download a brochure open this url https://www.gmccanada.ca/content/dam/gmc/na/ca/en/index/download-a-brochure/02-pdfs/gcty19ct000-2019-gmc-yukon-catalog-cdn-en-aoda.pdf. 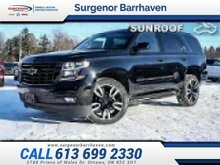 Interested in the 2019 GMC Yukon SLT - Sunroof - $487.33 B/W ? $81,125 * Plus HST and licensing. Freight & Fees Included. $91,470 * Plus HST and licensing. Freight & Fees Included. $95,405 * Plus HST and licensing. Freight & Fees Included. $81,420 * Plus HST and licensing. Freight & Fees Included.